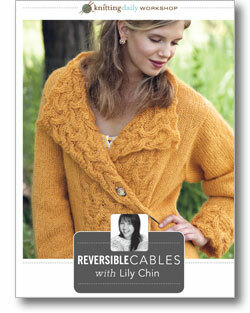 Expert Lily Chin guides you in knitting reversible cables to expand your knitwear options! General cable knitting techniques that will be your strong foundation for venturing into reversible knitwear. Reversible cabled knitting that is ribbed, identical front and back, not identical front and back but still reversible, variations on simple reversible techniques, bicolored brioche knitting, mock cable knitting, and more. Finishing techniques and yarn options for making your reversible knitting stand out in a crowd, including ways to make your knitwear less bulky, i-cord trims, and more. Whether knitting reversible cables with one color, two colors, or three—Lily’s teaching style will have you confidently knitting reversible fashions in no time. and start learning with Lily today!